A lavish Renaissance design telephone desk and chair set from about 1915 has a black marble top. Deeply embossed cast brass panels rest in hammered wrought iron frames with worn velvet backdrops. Doors opens to a compartment for a land line, there is a door in the back to open and put a phone inside. 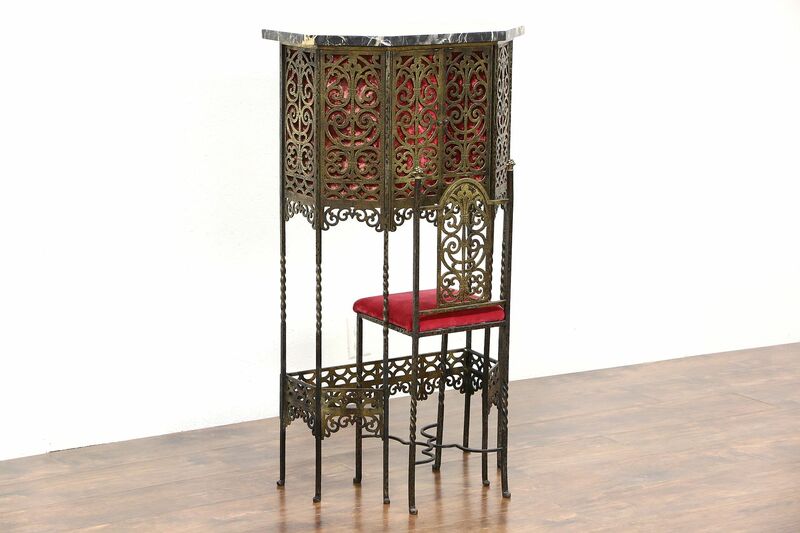 Hammered filigree panels are dramatic on this American made antique furniture. The Italian "Nero Portoro" marble has an old professional repair, some flakes and filer on the back edge, it has been polished and sealed for protection. Size is 23 1/2" wide, 12" deep and 42" tall, the matching chair is 11" wide, 11" deep, 38" tall and the seat is 18" high. Please view 26 photos at full screen size for best detail.